Undivided is what ignited Love Akron’s passion, and efforts, in modeling this locally. But it wasn’t just Love Akron who was interested in this type of life-changing project; a group meeting at First Congregational Church, and Derran Wimer, with Summit Education Initiative, were all inspired together. That very night of seeing the film, Penny thought ‘I need to talk to the principal of Findley’. 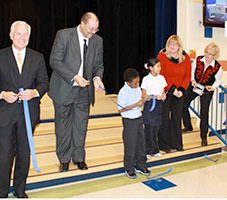 Findley Community Learning Center (CLC) is a Kindergarten through 5th grade school in Akron. “I felt compelled to speak with her,” Penny says. The next day she made a phone call and the rest is history. Findley CLC is a special school, representing children that come from a variety of ethnic backgrounds, all part of the North Hill Community. Of the 500 children, nearly half are English as Second Language students. There are 7 different languages and nearly 17 different dialects in the school. “I think there are 12 country flags in the hallway right now – anything from Jordan to Nepal to Mexico. It’s unbelievable,” Penny said of the diversity. A lot of this has to do with Findley’s location right down the street from the International Institute of Akron, which brings in a large population from Nepal and other countries. “There’s a lot of diversity that comes in and settles in the Akron/North Hill area,” Penny shared. This past September the Love Akron breakfast along with the Akron public schools raised enough to hire Penny as part-time coordinator of the Adopt-A-School initiative. Now, nearly 5 months following the breakfast that introduced these adorable kids, Pastor Ford and Penny give us an update as to how things are going. “So far the response has been amazing. Love Akron has done a great job,” Penny said. One hundred people have signed up to volunteer. 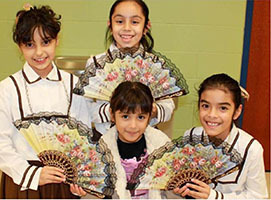 Volunteers do everything from engaging with students in a classroom, to helping a teacher, or being involved with Akron Reads to help 3rd graders acquire reading skills, to special events, like a field trip to the Civic Theater to see the Nutcracker. “Those kids didn’t have money so Love Akron wrote out a check and other people gave and said ‘These kids have got to go,’” Penny shared. Of all they’re doing, the 3rd grade reading initiative stands out as being of great importance to Penny. They have added 13 Akron Reads tutors - adults that are committed to meet with their students once a week. “The teachers aren’t used to getting help or getting things they need. There wasn’t funding (before this),” Penny said. They also have 7 adults coming in on a regular basis now to help teachers in their classrooms. They hope to get more. “Even the kindergarten teachers do not have assistance in this school,” she said of their lack of help. Pastor Ford has even begun volunteering his own time reading with a 4th grade class. “Most of all I think they want a man in their 4th grade class. I think they need role models,” Ford said. “It’s important to get men into the classroom as a role model,” Penny agreed. Bus chaperones would also be a help. “What can we do to take as much of the load off of the teachers and the administration so they’re happier at what they’re doing and more affective?” is the question Ford asks. So far, the community has shown tremendous support, but the momentum needs to continue in order to accomplish all they hope for in these kid’s lives. They’ve had everything from school supplies and extra uniforms donated, to coats, which are a great need. Twelve out of the 500 students ride the bus to school. The rest walk, rain or shine or snow. Akron firefighters brought over about 300 coats. Other groups have collected hats and scarves. 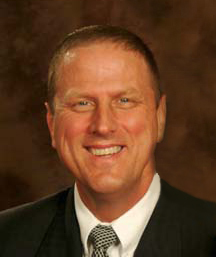 Many families have even been adopted by members of the church. Some families in dire need were given Christmas gifts. “People are so generous if they know there’s a need,” Penny said. The greatest needs right now are volunteers in the classrooms on a regular basis and people willing to establish relationships through tutoring. Assisting teachers, chaperoning and monetary donations for field trips are also on the list. “If I could fill every opportunity that a teacher has for someone to come into the classroom to help with the computers, reading and math time (that would be ideal),” Penny said. “If we could have a tutor for every 3rd grader who needs one, and maybe even every 1st and 2nd grader too, because it’s so important to reach these reading benchmarks,” she continued. Watch for next week’s story to find out more of their dreams for the future, the “roadblocks” they are facing and how they are working with the Summit Education Initiative to measure what they are doing to make it a success. 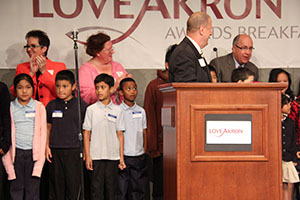 For more information on Love Akron and to find out how you can get involved, please visit www.loveakron.org.